The Ultimate Underdog Peugeot 205 RSS vs Audi R8! - Muscle Cars Zone! 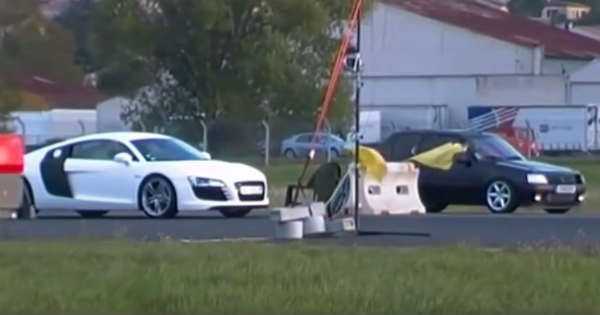 The Ultimate Underdog Peugeot 205 RSS vs Audi R8! When it comes to surprising results and finishes we have witnessed and seen everything, but have you ever thought that the Peugeot 205 RSS can compete against the modern super cars, and not just compete against, but win a race? Neither did we, but the following video might give us the answer how can that be possible. What you are about to see is rather surprising and heart-breaking for all of the Audi fans, so better prepare yourself to make your eyes pop out. Namely, we are on a drag track and this guy decided to film the whole race between a Peugeot 205 RSS and the almighty Audi R8. The race took place in Albi back in 2012. So the Peugeot entered as the complete underdog. But the driver had something else in mind. Though the Peugeot 205 RSS might seem normal from the outside, it had an absolute beast under its hood. Seconds after the race starts, and at first we can see that both of the cars hold up fine and are equaled throughout most of the race. But just couple of meters from the finish the Peugeot did the impossible. It managed to take over the first place and eventually winning the race. Everyone at the place was cheering and applauding to the driver. After this race we can definitely say that you should not judge a book by its cover, or a car. Check the video for more and see what the race looked like! Finally, check out the best 5 drag races on Youtube, so far!